(LWI) - The Lutheran World Federation (LWF) initiative supporting churches’ implementation of the Sustainable Development Goals (SDGs) has been launched in Colombia, with faith and government leaders praising its potential to strengthen peace building in the country. “After a number of years of internal conflict, and a society that has grown ever more polarized, our biggest hope for this project is to see churches of different traditions and faith-communities across the spectrum, united in working for peace and reconciliation,” said Bishop Atahualpa Hernández, president of the Evangelical Lutheran Church of Colombia (IELCO). Colombia is one of four target countries where the LWF is rolling out its focus on five SDGs that churches across the communion have identified as priorities in their respective contexts. IELCO hosted a workshop on SDGs to launch the national initiative, 14-16 November, with participants from local churches and other faith-based organizations, government, United Nations and churches from the wider Latin American region. IELCO President, Bishop Atahualpa Hernández. 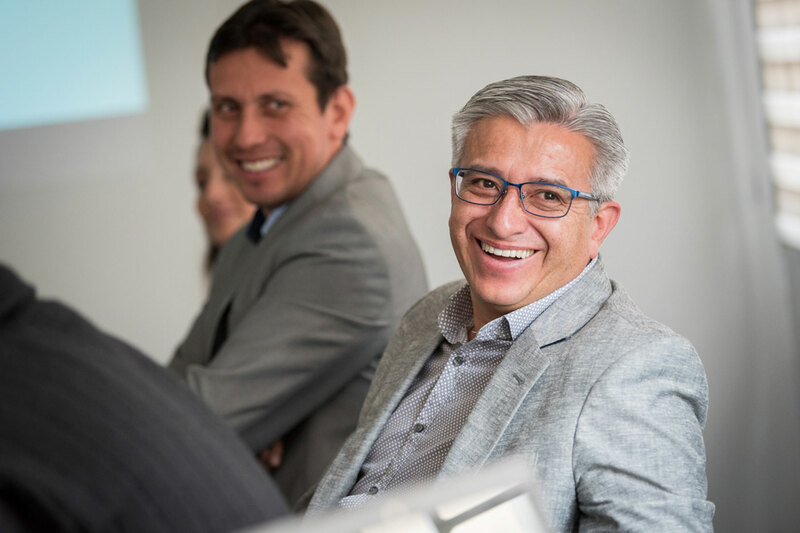 “For us as the Evangelical Lutheran Church of Colombia, it is a great privilege to participate in Waking the Giant,” added Hernández, whose church also acts as convener of an emerging platform of churches from a dozen different traditions in Colombia. Dr Lorena Rios Cuellar, director of the Office of Religious Affairs in the Colombian government, expressed appreciation for the effort by the LWF and IELCO to convene the religious leaders, describing the faith sector as “one that has both passion and motivation” to work for sustainable development. She said the government has a responsibility to make churches’ work visible in the Latin American country. “This initiative is very important for us, as it is important that we support and reinforce those spaces, those experiences where faith communities are working together,” Rios noted. “It is the force of working together that makes the impossible possible,” she added. 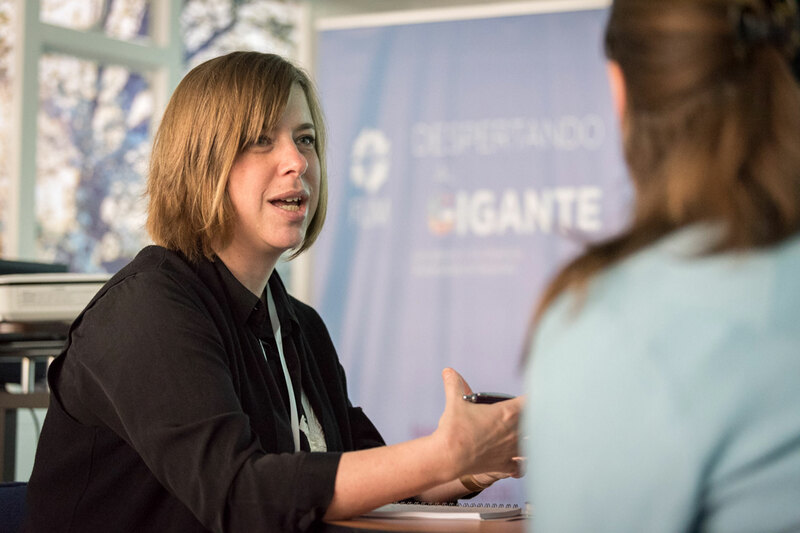 LWF program coordinator Julia Brümmer leads a workshop session at the national launch of the “Waking the Giant” initiative in Bogotá, Colombia. 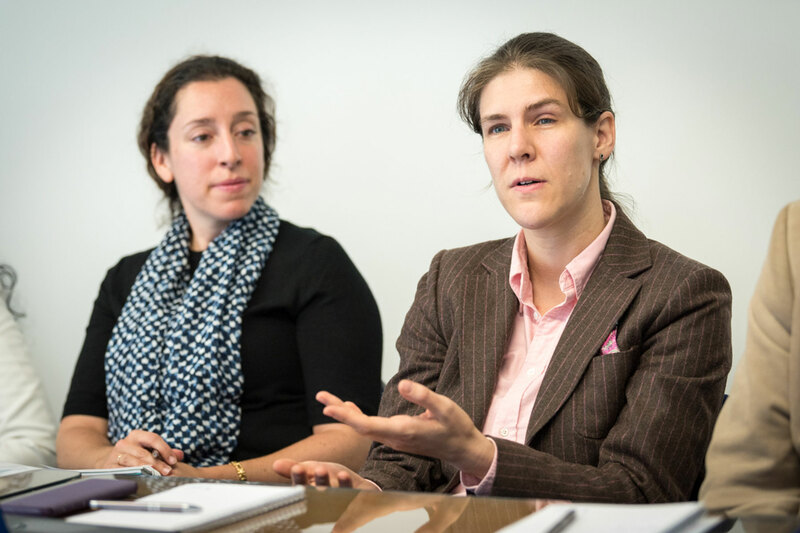 The LWF launched the initiative as a global project on 10 October in Geneva. The five SDGs identified are health (SDG 3), education (SDG 4), gender equality (SDG 5) reducing inequalities (SDG 10) and promotion of peace and justice (SDG 16), as these are areas where churches have gained long-standing experience and credibility. Bishop Eduardo Martínez, former president of the Evangelical Lutheran Church of Colombia, was among local church leaders at the workshop. Rev. Sonia Skupch, general secretary of the Evangelical Church of the River Plate (Argentina) in a conversation during the Colombia national launch. 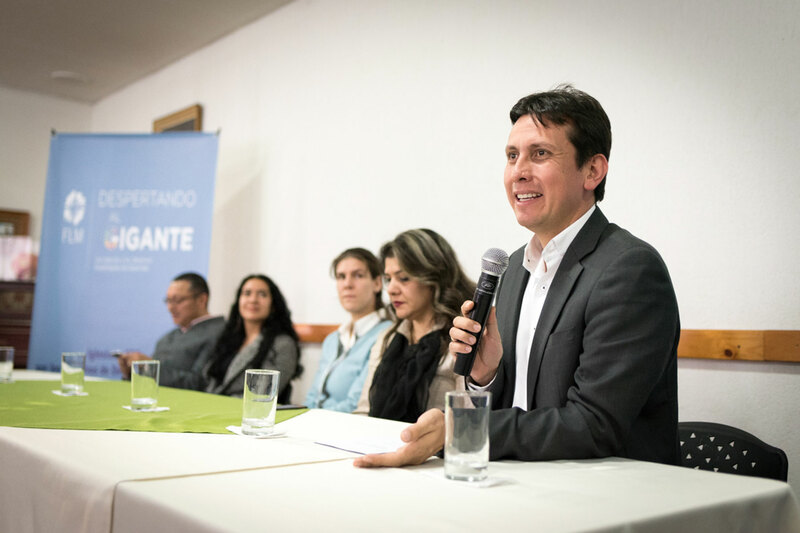 “Waking the Giant is both about giving visibility to the work of the churches, and about strengthening capacities for churches to understand and engage with the SDGs, to be able to contribute effectively,” said Jairo Barriga, executive director of the Fundación de Diaconía Pazos of the Presbyterian Church in Colombia. “The initiative presents a great opportunity for churches, for the ecumenical family, for all those who are interested in overcoming the challenges of the world today. It is not the first time that we take on the issues addressed in the 2030 Agenda, but we are hopeful that at the end of 2030, we can see much greater results than we saw with the millennium goals,” Barriga added. Dr Mardory Llanos, deputy director for religious affairs in the government of Bogotá, stressed the potential of the initiative moving forward. Waking the Giant initiative is a good opportunity to consolidate efforts and help different traditions to come together in building a nation that is peaceful and reconciled, a nation that lives and experiences the development envisioned in the 2030 Agenda. In Colombia, Waking the Giant is funded by the Finnish Evangelical Lutheran Mission. Written for LWI by Albin Hillert.